When Ronni Bennett discovered elder playgrounds online a few years ago, she immediately fell in love with the concept. 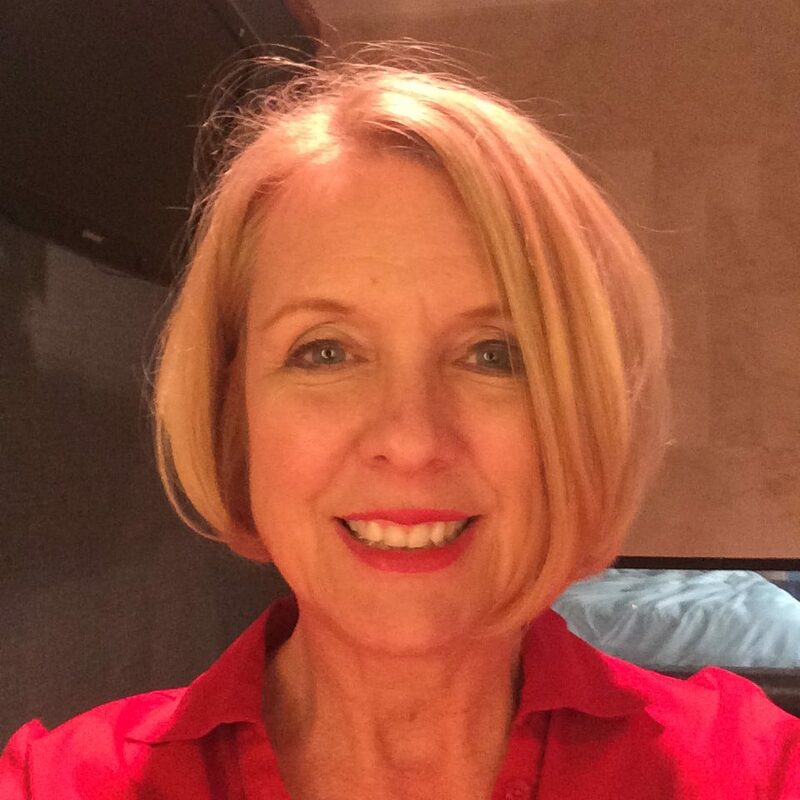 She began researching how the outdoor parks, designed specifically for the social and fitness needs of older adults, have become popular in Asia and Europe. She interviewed designers and looked into the special equipment involved. Bennett, 75, a retired web producer who writes an influential blog about “what it’s really like to get old,” began lobbying her city council to build an elder playground in Lake Oswego, OR, the town where she lives. She was successful: her community now has a fitness park with 10 pieces of equipment designed specifically for older adults, including three that are wheelchair-friendly. Bennett’s experience may help explain why elder playgrounds are taking off much more slowly in the United States than in other parts of the world. While interest is growing, only a handful of dedicated “elder playgrounds” have been installed in the United States. Convincing communities to give money and space to parks that are for elders only is proving to be a hard sell. Elder playgrounds have been around for about 20 years in other countries. In 1995, with the adoption of the “Physical Health Law of the People’s Republic of China” along with an “Outline of Nationwide Physical Fitness Program,” China began building outdoor fitness centers geared to all ages. In 2003, the University of Lapland in Finland, partnering with manufacturer Lappset, designed and built a playground for elders for research. Around the same time, Japan began repurposing children’s playgrounds as “Nursing Home Prevention Parks,” with specialized workout stations and classes, in response to the nation’s aging demographics. The concept quickly spread to Germany, England, Spain and Canada. 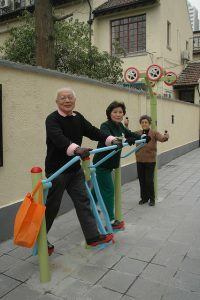 Elder playgrounds typically feature low-impact exercise equipment designed for the specific fitness priorities of older adults, such as building balance, coordination and flexibility. Equipment is lower to the ground and equipped with seats or grips geared to people who might have limited mobility or strength. Regular use of an elder playground can boost older adults’ physical fitness and help prevent illness. One study found improvements in balance, coordination and speed after just three months. Some elder playgrounds have been built in the United States, and there are hopeful signs that more are on the way. Colin Milner, founder and CEO of the International Council on Active Aging (ICAA), notes that many manufacturers of outdoor playground and fitness equipment have added or expanded lines of equipment specifically for older adults in recent years. “These companies don’t jump on board unless they feel there is a significant opportunity,” Milner said. While ICAA hasn’t tracked elder playgrounds specifically, its 2015 survey of health clubs, senior centers, retirement communities and continuing care retirement communities (CCRCs) found that 21 percent planned to purchase outdoor exercise equipment by 2017. At the time of the survey, some 41 percent planned to add game courts by 2017, 38 percent intended to create outdoor fitness or exercise trails and 57 percent aimed to install walking trails or paths. Michael Cohen, a veteran designer of children’s playgrounds, first became intrigued with spaces devoted exclusively to older adults when he saw a Good Morning America report on a “pensioners’ playground” in Manchester, England. That led him to found Must Have Play, an Ithaca, NY-based design group exclusively focused on innovative playgrounds for older adults. He has designed several elder playgrounds for parks in US cities, but so far none have actually been built. Cohen envisions elder playgrounds as places that offer more than a good workout. He’d like to see elder playgrounds promote play in forms suited for older adults’ abilities, with courts or equipment for sports like pickleball, paddle ball, bankshot basketball or bocce ball, and loaded with features like water elements, walking paths and game tables. In the United States, playgrounds that cater to multiple generations are catching on more quickly than those designed exclusively for older adults. That’s what happened at Carbide Park, in Galveston County, TX, which added an elder playground in 2014. The park has become a favorite destination for field trips from three local senior centers. On days when the weather is not too hot, busloads of older adults arrive to enjoy the park, according to Julie Diaz, director of parks and cultural services for Galveston County. Some elder playgrounds have arisen as outdoor extensions of local senior centers, such as the fitness park at the Rockville (MD) Senior Center. Cohen says that’s a big plus—proximity to a senior center or a senior residence gives visitors access to clean bathrooms and a place to go for help in the event of emergency. The Rockville park features equipment developed especially for the needs of older adults, according to Chris Klopfer, the center’s senior sports and fitness supervisor. The Rockville playground’s equipment has hand grips on everything, so that older exercisers can stabilize themselves. If they do fall, a non-slip surface made from rubberized tires makes injuries less likely. One local trainer regularly brings older adult clients to the park for workouts when the weather is good. 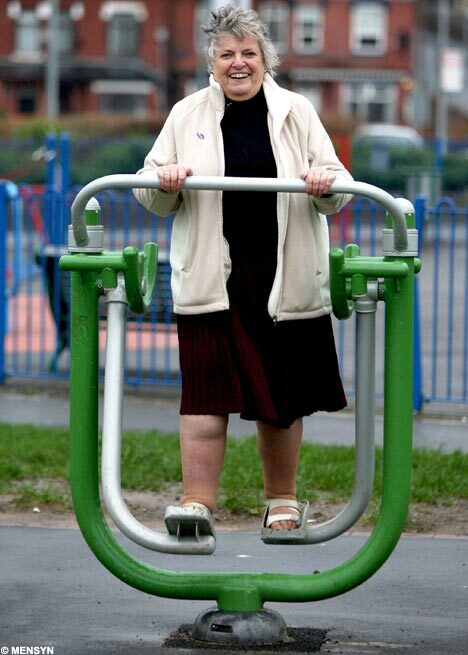 One of the trainer’s clients, Ellie Rouff, 72, adjusted her workout schedule to allow for more sessions at the park. “I’m still working in an office and sit at a desk five days a week, so if I can be outside, I love it,” Rouff said. She likes the fact that the equipment has usage instructions and allows her to do exercises she couldn’t otherwise. She can no longer do push-ups on the floor but can perform them on one of the machines. Research suggests that regular use of an elder playground can boost older adults’ physical fitness and help prevent illness. The University of Lapland studied one group of 40 people, ages 65 to 81, and found significant improvements in balance, speed and coordination after just three months of guided exercise (90 minute, once-a-week sessions) on an elder playground. Increased fitness not only improves quality of life, it can also help keep the cost of health care down, ICAA’s Milner notes, citing a study that found that adults who do 90 minutes of cardio exercise a week can save $2,500 annually on health care. Elder playgrounds also promote social engagement, an important factor given that many older adults become isolated and lose social ties. Numerous studies have linked isolation with poorer health among older adults. Cohen designs elder playgrounds with conversational seating, to make them inviting even to people who may not wish to exercise. The exposure to sunlight helps reduce vitamin D deficiency and may help older adults sleep better at night. But while multigenerational spaces offer great benefits, they’re not designed exclusively with seniors’ needs in mind, Cohen said. “In reality, many multigenerational designs tend to pay short shrift to the needs of older adults,” he said. Many are essentially children’s playgrounds with a walking path added nearby or a few exercise machines located in adjacent space. Milner agrees. “Multigenerational can be a little bit intimidating to older adults,” he said. “The noise might be overbearing.” Children who play raucously can be overwhelming to those living with dementia and possibly a safety issue if the children are underfoot among adults with mobility issues. A study at Germany’s Wiesbaden Polytechnic indicated that many older adults found it embarrassing to exercise in the presence of younger people and were more inclined to use more private playground settings visited mostly by generational peers. Another factor: some older people simply don’t feel comfortable around children. As a single, older man, Cohen says he’d personally feel uncomfortable on a playground and thinks some parents might feel that way too. The Lake Oswego FIT Spot has naturally attracted some multigenerational use—it’s located near a children’s playground, so some grandparents and parents use the equipment while keeping an eye out as kids play nearby. But Ronni Bennett thinks it’s important to have dedicated spaces where elders, especially those who can’t afford a health-club membership, know they can meet peers and exercise comfortably and safely.